38 Hope Street will soon see two twin residential towers rise 28 levels above South Brisbane. 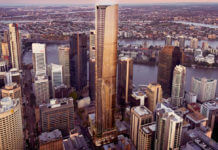 In what is planned to be the new residential extension of the CBD, South Brisbane is now home to 9 residential tower projects either proposed, approved or under construction. With so much competition, architects are designing better, higher quality designs that Brisbane has not ever seen before. The architect’s behind 38 Hope Street is Brisbane’s RotheLowmanWhite, who also designed Austin and The Glass Factory. 38 Hope Street comprises of mixed use development of 2 towers with retail space on ground floor. The project includes a rooftop recreation level on level 29. 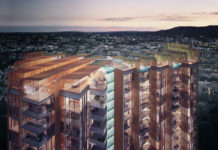 The submission of 38 Hope Street follows the recent release of Soda Apartments in Cordelia Street which includes a rooftop pool and recreation deck on level 20.
any indications from the architects where they’ve located the driveways to sites? Another fantastic creation from Aria. I was so impressed with Vine on Russell and Artisan; this is so great for the South Brisbane area. Such an interesting design for a unique area. I think this will really support the ongoing gentrification of South Brisbane. South Brisbane is coming along quite well; I hope they keep this up. The architectural design looks pretty impressive. Where can I found out more about this? Great to see planning for the future is happening now! With the inner city living increasing in demand, planners and developers alike need to be thinking outside the box. I like what I’m seeing from Aria Property Group. This area is undergoing a dramatic transformation. The infrastructure and public amenity is world class, makes sense to continue the supply of residential developments; especially on this large scale. 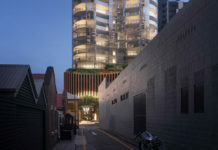 A building design like this is going to change the face of Brisbane City. Where can I find more about this development. Display unit is available now, please let me know you are interested to meet up and inspect the site.